I’m not excited about Super Bowl XLVII. I don’t really follow football other than watching the Packers play, and I usually watch all the best Super Bowl commercials online before they air. Apparently, I wasn’t really interested in the Super Bowl ten years ago, either. 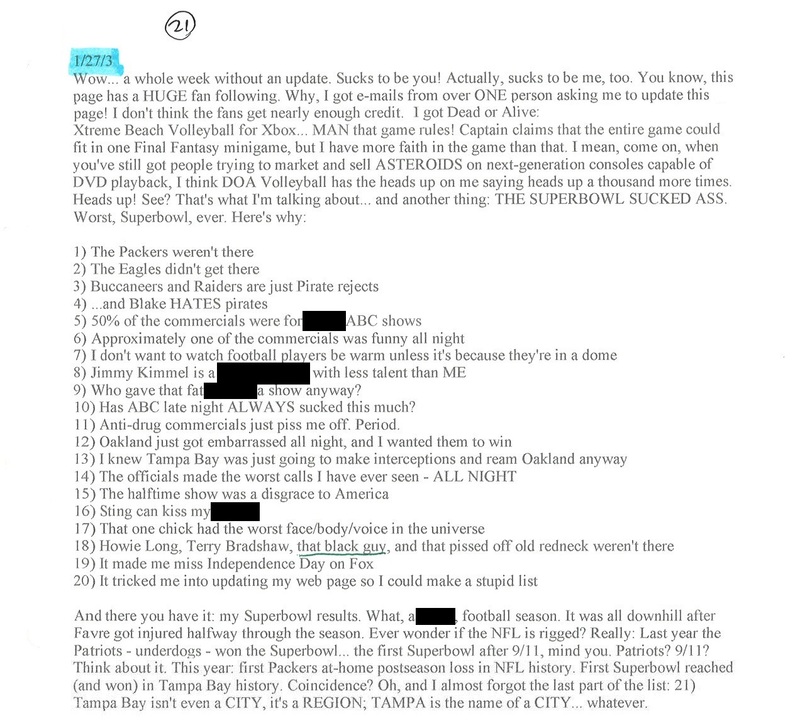 The following is a printed out page from my web site, featuring a post that I wrote on January 27, 2003 – the day after Super Bowl XXXVII. I printed out this page and turned it in to my creative writing teacher, since we were required to write outside of class. it appears that my teacher only had one comment, and that was to underline a phrase that I wrote that was not politically correct. I hope I don’t offend anyone with it, but frankly, I didn’t remember the name of the guy I referenced, so I wrote what I wrote. But I do think he’s awesome and rocks as a commentator. More or less politically incorrect in 2013? I don’t know. Just please try not to freak out: remember, I wrote this when I was 17. I apologize for the political incorrectness of the underlined phrase… but I really DO like that one African-American NFL commentator, he’s awesome! “Buccaneers” and “Raiders” ARE both rejected versions of the word “Pirate.” I bet that would be all over the Internet if it happened today. Jimmy Kimmel isn’t so bad these days. No more hate! I still don’t like anti-drug commercials, but at least they’re less patronizing than they were ten years ago. I’d never heard of Sting prior to this Super Bowl. After seeing the halftime show, I wish I had still never heard of him. It’s funny that my teacher took exception to calling that one African-American commentator “that black guy” but she had no problem with me calling Terry Bradshaw “that pissed off old redneck.” Also, what is that guy’s name?! “It made me miss Independence Day on FOX” is one of my favorite lines I have ever written. To this day, I STILL think it’s incredibly bizarre that the Patriots won the first Super Bowl after 9/11. I hope you enjoyed this little trip down Super Bowl lane! I frankly don’t care who wins today, and I’ll be doing a radio show during the game anyway. Maybe I’ll watch next year.